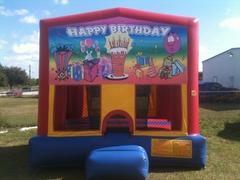 What better way to say Happy Birthday than to get a Happy Birthday themed Bounce House Rental. Bright and colorful this Tampa Bounce House features a large bounce area, a basketball hoop and a saftey ramp entryway. Spacious enough to let your kids jump, bounce and play for hours. This unit is great for Boys or Girls and focuses on your little ones birthday. Also be sure to check out our Interactive Games.